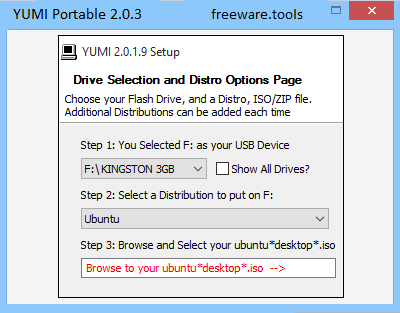 YUMI Portable is a tool for creating multiboot USB drives. It's able to take a number of bootable images - Linux distros, antivirus, partition managers, recovery tools, forensics, more - and combine them onto a single drive. Boot from this and a menu allows you to choose the tool you need. It can be used to create a Multiboot USB Flash Drive containing multiple operating systems, antivirus utilities, disc cloning, diagnostic tools, and more. YUMI uses syslinux to boot extracted distributions stored on the USB device, and reverts to using grub to Boot Multiple ISO files from USB, if necessary. Aside from a few distributions, all files are stored within the Multiboot or Yumi folder. A bootable USB disk is a convenient way to deploy applications and operating system distributions, but a dedicated application is required for you to create one. YUMI Portable is an open-source program that can help you with this issue. Built using the PortableApps platform, YUMI Portable (or Your Universal Multiboot Integrator Portable) can be launched from any removable device without affecting the registry of the host system. Working with it is a breeze, thanks to the intuitive interface and straightforward options. In just three simple steps, you can start building a bootable drive that can be then used to deploy apps and different operating systems onto any computer. First, you must select the USB drive that will be used for distribution. Note that drive formatting is advisable, but this will result in the permanent deletion of all the data on the USB stick, so be careful not to lose important data. YUMI Portable provides support for a wide range of operating systems, allowing you to create bootable drives with Linux, Ubuntu, Fedora, OpenSuse, Debian, and other distros, as well as Windows (XP, Vista, 7, 8), Kon-Boot, and a variety of antivirus. The AVs include Acronis Antimalware CD, AVG Rescue CD, Windows Defender Offline, etc and testing tools (forensics, penetration and memory testing, disk cloning, backup, password finders, etc. Provided you have the ISO or ZIP distribution, you just have to select it and let YUMI Portable do its job. But if the file is not available, YUMI Portable can open a download page to grab it. YUMI Portable is definitely worth your attention since it offers a quick and easy method to create bootable USB devices. What's more, it is capable of identifying the installed distros on a connected drive and allows you to remove them. No installation is required, and you get to build a bootable drive in just a matter of minutes.